Bloomsbury USA Childrens, 9781681193649, 368pp. These fractured, unconventional spins on classics like "Medusa," Sherlock Holmes, and "Jack and the Beanstalk" provide a behind-the-curtain look at villains’ acts of vengeance, defiance, and rage--and the pain, heartbreak, and sorrow that spurned them on. No fairy tale will ever seem quite the same again! 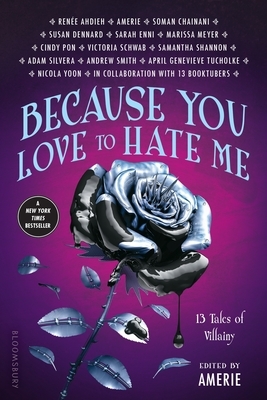 Authors: Renée Ahdieh, Amerie, Soman Chainani, Susan Dennard, Sarah Enni, Marissa Meyer, Cindy Pon, Victoria Schwab, Samantha Shannon, Adam Silvera, Andrew Smith, April Genevieve Tucholke, and Nicola Yoon. Amerie is a Grammy-nominated singer-songwriter, producer, and lifestyle bon vivant. The daughter of a Korean artist and an American military officer, she was born in Massachusetts, raised all over the world, and graduated from Georgetown University with a bachelor’s in English. She began writing at the age of seven, stories of fairies and pirates and witches and phantoms. She lives mostly in her imagination, but also on Earth with her husband, her parents and sister, and about seven billion other people. When she isn’t writing or creating music, she talks books, beauty, and more on her YouTube channel Books Beauty Amerie.